You’ll find several important controls on the front of your iPhone. These controls include your iPhone’s Ring/Silent switch, the volume buttons, and the receiver, among others. View the front of the iPhone. Ring/Silent switch: The Ring/Silent switch, which is on the left side of your iPhone, lets you quickly switch between ring mode and silent mode. When the switch is set to ring mode — the up position, with no orange dot — your iPhone plays all sounds through the speaker on the bottom. When the switch is set to silent mode — the down position, with an orange dot visible on the switch — your iPhone doesn’t make a sound when you receive a call or when an alert pops up on the screen. The only exceptions are alarms you set in the built-in Clock application, which do sound regardless of the Ring/Silent switch setting. Volume buttons: Two volume buttons are just below the Ring/Silent switch. The upper button increases the volume, and the lower one decreases it. You use the volume buttons to raise or lower the loudness of the ringer, alerts, sound effects, songs, and movies. And during phone calls, they adjust the loudness of the person you’re speaking with, regardless of whether you’re listening through the receiver, the speakerphone, or a headset. If you require privacy during phone calls, use the included Apple headset instead of the receiver. 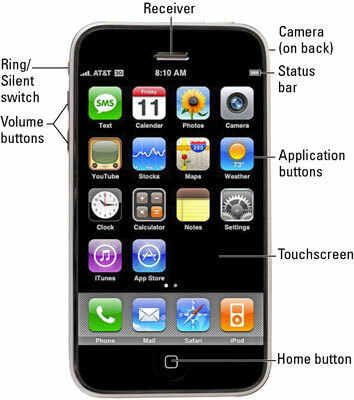 Touchscreen: This is the high-resolution screen where you’ll find many of the iPhone’s controls. Application buttons: Each of the 18 buttons launches an included iPhone application.